For seals see the seals page. Also see another dolphins page. All A5@300dpi quality unless indicated otherwise. 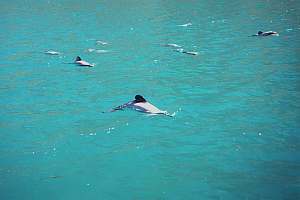 Hectors dolphins (Cephalorhynchus hectori) are native to New Zealand, mainly found along the shores of the south Island. 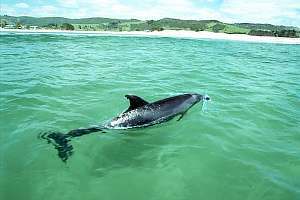 A small population of what is thought to be a subspecies, Mauis dolphin, is found along the west coast of the North Island. 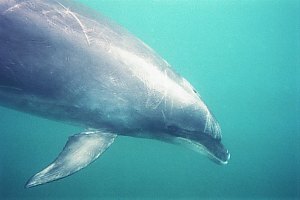 This dolphin has a tubby, endearing shape with rounded dorsal fins and flippers. 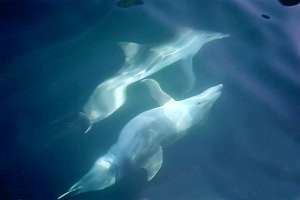 It is also one of the smallest dolphins in the world, rarely exceeding one metre. 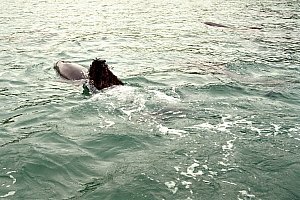 f026502: Hectors dolphin at the surface. f026505: A pod of young Hectors dolphins taking a moment's rest. f026527: Hectors dolphins are small and tubby but very energetic, requiring lots of high energy food. 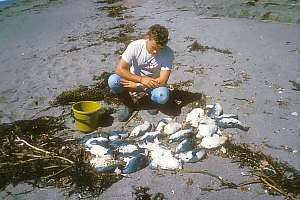 They hunt fish like young red cod over the bottom and young mullet at the surface. f026526: this photo shows a number of young hoons chasing one another in their never ending games. 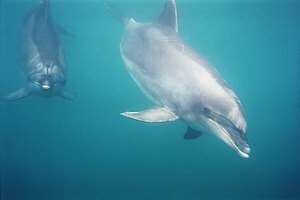 The bottlenose dolphin (Tursiops truncatus) is New Zealand's most common dolphin as it is found along all coasts while migrating far afield in the Pacific Ocean. 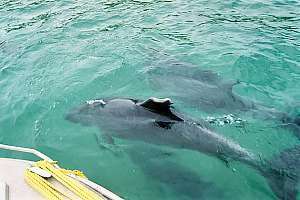 It is a large dolphin, reaching some 3.5 metres in length. 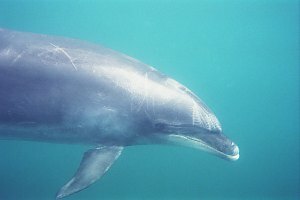 Living in relatively small pods of 5-40 animals, this dolphin is often encountered racing ships and playing in their bow waves. Recently its numbers appear to be declining and the number of calves in each pod too. 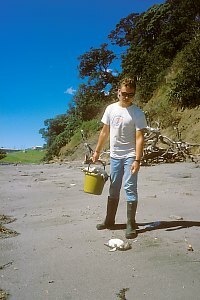 In certain years many dead calves are found washed up on beaches but it is not precisely known why. 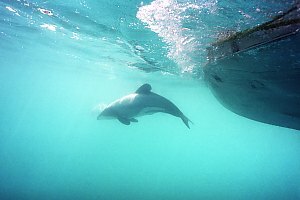 f011708[A6]: a dolphin encounter usually consists of a fleeting visit by the largest males. Each has distinguishing birth marks and scratches from real and play fights. 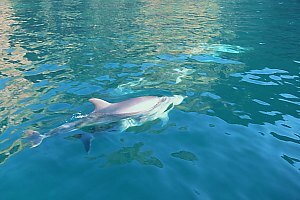 f011705[A6]: closeup of a large male bottlenose dolphin (Tursiops truncatus). 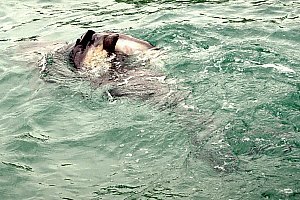 f011705[A6]: closeup of a large male bottlenose dolphin. f014311: in recent years one sees more and more deformed dolphins like this bottlenose dolphin with a grossly deformed dorsal fin and shortened tail stock. It is worrisome. 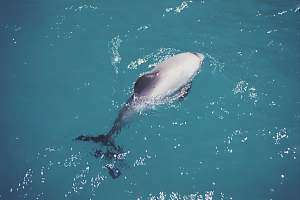 f014306: a mother and her deformed calf. The bottom animal has a fat belly and a deformed tail stock which prevents it from being able to provide for itself. But the care of dolphins for their calves and those of others is such that pods form of exclusively deformed dolphins and their mothers. 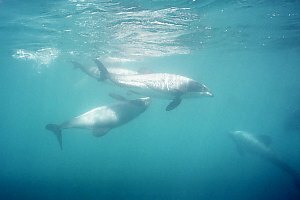 f014303: a mother dolphin pushes her deformed calf because its deformed tail stock prevents it from swimming well and providing for its own food. 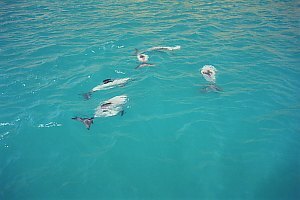 f011219[A6]: as female dolphins mature, they become seriously involved in the game of cradling seaweed on their backs. Like dolls' play for girls, it prepares them for motherhood when their newly borns require to take their first breaths. (see f011226) f011226[A6]: a mother dolphin cradles her dead baby over her back in an attempt to bring it back to life. Having done so for a week, by day and by night, her baby is now falling apart, its entrails showing. Tragically, we see more and more of this happening. 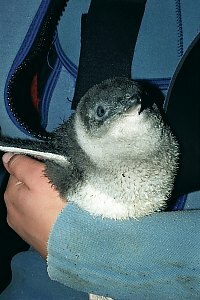 The little blue penguin (Eudyptula minor) lives far away from Antarctica and is found along all New Zealand's shores, although it is more common along the South Island. 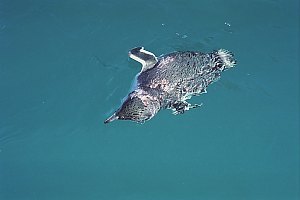 The white-flippered penguin is a subspecies (Eudyptula albosignata) and is less blue on its back while having distinctly white bottomed flippers. 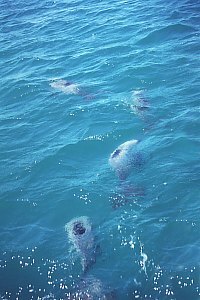 These animals spend most of their time in the sea, fishing for small shrimps and fish. By night they return to the shore to dry, walking long distances uphill to their secretive burrows. The animals suffer a hard life and mortality is high, particularly among the young. 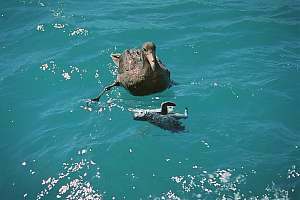 f210321: a giant petrel (Macronectes giganteus) demolishing a white-flippered blue penguin (Eudyptula albosignata) with its powerful beak. We don't know whether it found it dead, or whether it caught it. f026626: fairy penguins have a hard time to survive but deteriorating seas do not make life easier for them. As people try to protect their colonies, the sea still threatens them with human induced poisonous food. f015214: blue penguins have strange nesting habits. 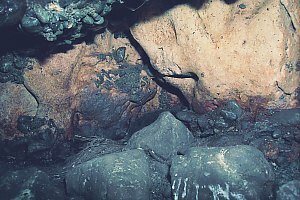 They either clamber hundreds of metres up a steep coast to make themselves a burrow in the soil, or they select a sea cave where they are very particular about their choice. 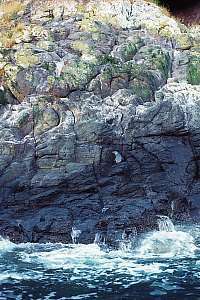 Can you see the baby blue penguin near the centre of the picture? f015215: blue penguins lay two eggs but one of the chicks usually dies. 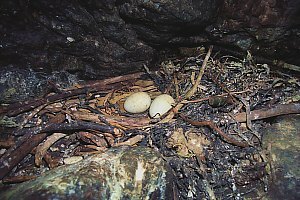 The two eggs shown here are infertile and the parents have now abandoned them after brooding for three months (Sept-Nov). In certain years the whole crop of baby penguins fails. It happens more frequently now. Why? f015217: a blue penguin chick patiently waits all day for its parents to return at dusk. 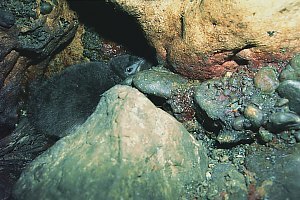 f015325: a blue penguin chick on its nest inside a sea cave. f015216: can you spot the baby penguin in this image? f212614: blue penguins suffer a hard life with high natural mortality, but humans do not make it easier for them. Finding a dead bird is always sad. 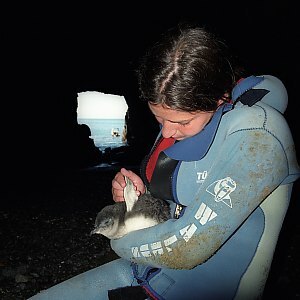 f015330: a teenage girl has braved the waves with a long swim, then clambered op the slippery pebbles inside a sea cave in order to cuddle a baby penguin. The photographer first handled the chick while incurring sharp pecks. 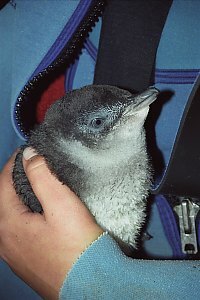 Then the baby penguin became more trusting of our intentions. 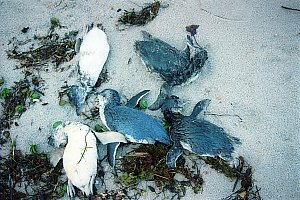 f990833: blue penguins washed up after a mass mortality event at sea. The causes of such mortalities are not known. f026611: Left: in the dim light of dusk, a blue penguin has returned from the sea, drying itself before clambering up the cliff, often for hundreds of metres to its burrow. 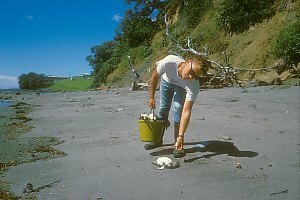 peng05: a young man collects dead penguins in a bucket, for the second day in a row. 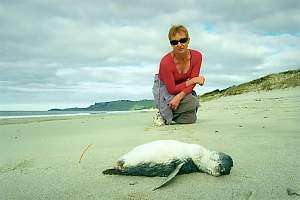 peng04: during some mass mortalities, dead penguins are swept into particular beaches where they can be picked up in scores. peng08: the spoils of another day of mass penguin mortality. 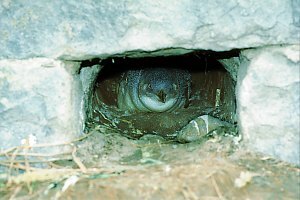 f026819: in places, blue penguins seek the shelter of human dwellings as this one has found here in the drain of a garden wall. The yellow-eyed penguin (Megadyptes antipodes) is much less numerous than the blue penguin. 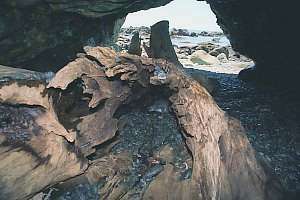 It is not found on the North Island of New Zealand. 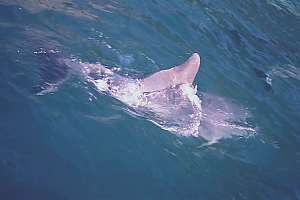 It is a very strong swimmer, capable of jumping clear out of the water, resembling a small dolphin. 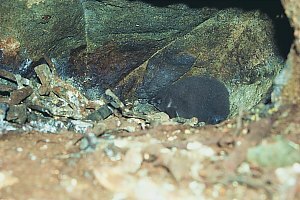 It does not make a burrow but maintains a lair underneath thick coastal shrubbery where its young and eggs are easily preyed upon by cats, rats and stoats. 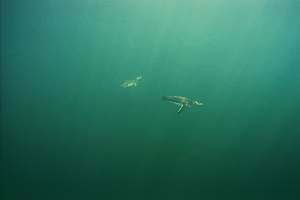 f026737[A6]: a pair of yellow-eyed penguins snapped while swimming in murky water. 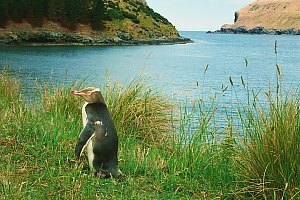 (Near Dunedin) f210411: a yellow-eyed penguin (Megadyptes antipodes) poses before the camera. Normally these birds are very shy, but at times one can be found with a more approachable attitude. 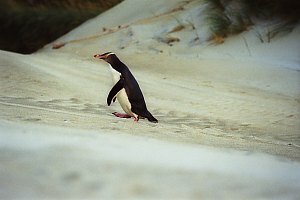 f026825[A6]: Yellow-eyed penguin crossing the much walked beach towards its den under a dense bush in the dunes. These birds arrive when dusk is so dark that they can hardly be seen. Sensitive film used. 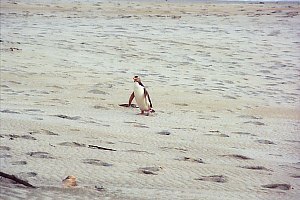 f026827[A6]: a yellow-eyed penguin trudges laboriously like an old man up the foredune, past the well camouflaged photographer. 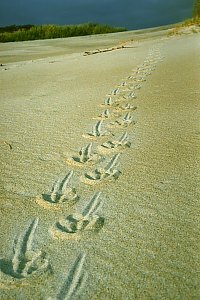 f210523: A yellow-eyed penguin's foot track leading into the dunes. 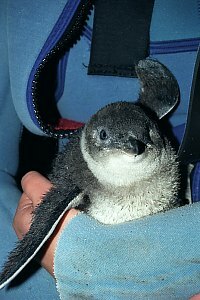 Often a mate calls from its den and its calls are returned before the penguin leaves the safe wavewash to trudge up the dunes. 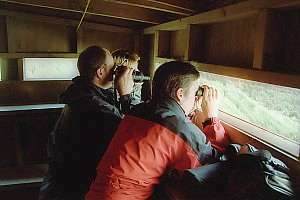 f026831[A6]: avid bird watchers have walked the long track to the hide specially built for watching penguins land at dusk. In the distance the slanting track taken by many birds, but some walk right past this hut.